There is a certain fascination amongst architects for digital media in different forms. Is it because media design as a discipline is seemingly independent from the restraints of a physical reality? Is it the ephemeral nature of a time based phenomena or even the possibilities of creating organizations of 'sites' in a virtual and dynamic construct? Looking at one aspect of media, the Interactive timeline is a model used in the creation of multi media content to coordinate audio and visual events in the context of the elapsing time and the commands of the user. The experience of contemporary interactive media though has little of the intuitiveness, sensuality and immediacy of real material space. Worse still, it usually forces the 'visitor' to submit to the medium as being trapped in a virtual cage, demanding his body and mind to become one with the Media (the couch potato effect). Nevertheless, a thinking in time and space is far from alien to architects. Timelines are used in the planning of architectural projects like airport terminals or museums. Anticipating the flow and behavior of travelers between check-in, duty free shopping and the waiting lounge, is affecting the architectural design, albeit so far only in its static material articulation. Two art installations are presented here to challenge the idea, that architectural design and digital interactive media are separate creatures by definition. HelloMrPresident.com. The alpine ski resort of Davos in Switzerland is hosting the annual World Economic Forum, open only by the most powerful international managers and politicians. The forum also becomes the focus for a considerable protest of anti globalization and environmentalist movements. Last year though, those groups were denied access to the town, officially for public security reasons. The usual demonstration format, involving a large number of demonstrators, had to be redefined. The creators of the project wanted to assure the presence of public opinion in Davos, in a very tangible form. 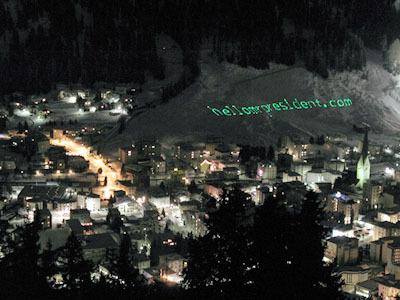 A concept by the Swiss media artist Johannes Gees was chosen to project digitally relayed messages by laser on to the snowy mountain slopes of the ski resort. The messages would be send by the concerned public via text messages over their mobile phone or the internet. Messages arrived from as far away as Argentina and Australia, carrying opinions over international boundaries, delivering them right at the feet of the assembled world leaders. A back channel recorded the projection spectacle, to broadcast it again live over the internet. The project proofs in a stunningly simple way, how media can become inherently specific to site and situation. The global power elite present at the convention were literally overshadowed by the intervention. This modern speakers corner is becoming alive in its local setting on the Swiss alps, just as well as the vast ubiquitous territory of the World Wide Web. Desert Rain is a joint project by the British art collective Blast Theory and the Computer Research Group at the University of Nottingham, England. It presents the Gulf War as an event that transformed our perception and understanding of the world, as it happens around us through a shift in the media culture. The war experienced as a live event, meditated through channels like the TV, becomes according to Jean Baudrillard, a virtual event. In a critical assessment, Blast Theory quotes an article by Paul Patton (University of Sydney) on Baudrillard: "the sense in which Baudrillard speaks of events as virtual is related to the idea that real events lose their identity when they attain the velocity of real time information, or to employ another metaphor, when they become encrusted with the information which represents them." The project comments those issues by inviting 6 visitors into an installation work of unprecedented quality. The event involves the visitors through a game narrative, in which lost members of the group need to be recovered. This happens in mixed realities of wandering through a physically designed set, which is combined with the experience of navigating through a virtual world. The 3D computer graphics are projected onto a curtain of water droplets, that surround the visitor, and physically isolate him from his peers. The fellow players appear as metaphors in the virtual world, but they can also be heard through a headset. This project leaves known design categories behind to create something quite extraordinary: It proposes a sensually rich environment, that lives as much from its physical presence, as it depends on the use of digital interaction technology and an understanding of time based interactive media. Both concepts act as great examples towards a new understanding of role architecture could assume. Spatial design could draw on the site-specific nature of media, as well as its properties over time. In turn, media ceases to be confined to audio-visual effects. It can just as well feature physical events on a common media timeline (like the waterfall being present as a material feature, a source of ambient noise and acting as a projection surface for the 3D computer graphics). This shows how the architectural space could in fact become an extended interface for new experiences and applications, let's call it an InterSpace. The two art installations may also open new dimension of using digital interaction technologies as an extension to both the programmatic and material palette open to Architects. Body, Media and space will enter quite different relationships over time, compared to the known conditions today, therefore architecture as a discipline will need to reach out towards new realities too.